San Jose, Calif. — San Jose State University is taking a new approach to commencement: For the first time, SJSU will hold seven ceremonies (one per college) to provide each of this year’s more than 10,000 graduates the opportunity to be called by name and individually recognized as he or she crosses the stage. The ceremonies will be held over a three-day period beginning May 23 at Avaya Stadium and the Event Center at SJSU. All will be streamed live on the SJSU website, where a schedule of the ceremonies has been posted. The Class of 2018 reflects San Jose State and the California State University’s defining characteristics: opportunity, quality and success. SJSU sends more college graduates into the Silicon Valley workforce than any other institution. This includes business, engineering and science graduates, in addition to education, social sciences, arts and humanities and applied sciences and arts degree holders. An estimated one-third of SJSU students are the first in their families to attend college. Carlos Alberto Sanchez earned two degrees at SJSU, where he now teaches. The son of Mexican farmworkers, he is the 2018 President’s Scholar. He will be honored at the Social Sciences commencement ceremony. SJSU has long produced the region’s teachers and nurses. SJSU will recognize 300 newly credentialed teachers and 449 new social workers, nurses, occupational therapists and other healthcare professionals at commencement. SJSU will grant 36 doctoral degrees, including 22 doctoral degrees of nursing practice and 14 doctoral degrees of educational leadership to future university faculty members as well as educators and clinicians seeking professional development. Students eligible for participation in the May 2018 commencement ceremonies have completed or will complete their studies in summer 2017, fall 2017, spring 2018 and summer 2018. 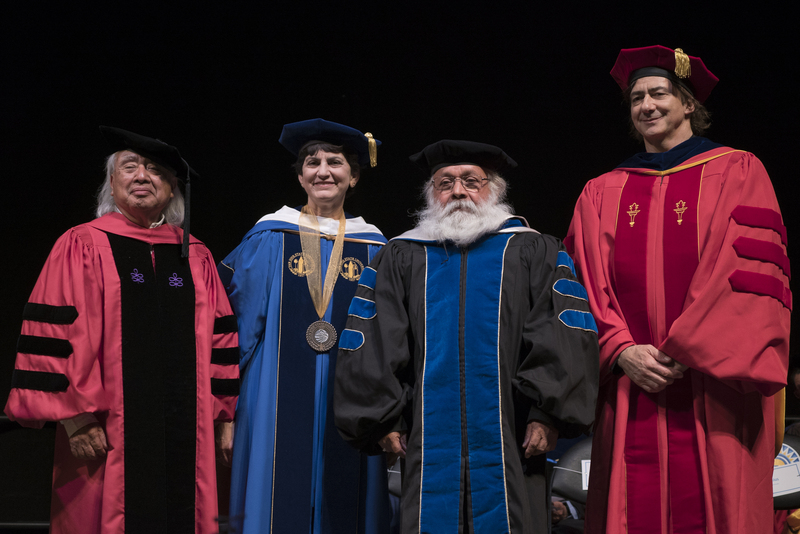 Artemio Posadas, a celebrated musician, dancer and teacher of traditional Mexican music, will receive an honorary Doctorate of Humane Letters at the Humanities and the Arts ceremony. In addition, three outstanding graduates will be honored at this year’s commencement ceremonies. Emily Moffitt will receive a master’s in environmental studies and the 2018 Outstanding Thesis Award at the Social Sciences ceremony. Her findings will help preserve Pacific-Slope Flycatcher bird habitats. Two students will each receive the 2018 Outstanding Graduating Senior Award for their academic achievements, leadership roles, community work and personal achievements. Nardos Darkera will be recognized at the Applied Sciences and the Arts ceremony, where she will receive a bachelor’s in public health. Sierra Peace will be recognized at the Social Sciences ceremony, where she will receive a bachelor’s in psychology. 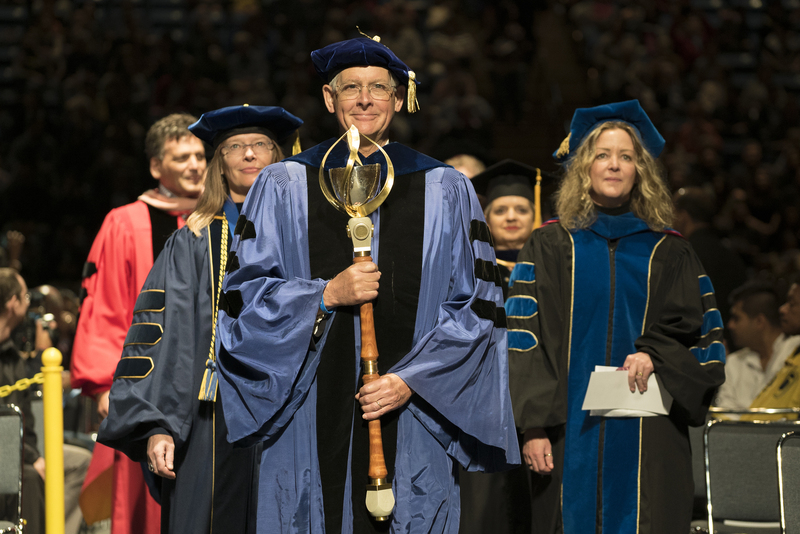 Among the very first items spectators will see at each ceremony is San Jose State’s new mace, an ornamental staff or scepter borne as a symbol of authority by the individual leading the processional of students, faculty and administrators as they enter the venue and take their seats. A gift from the Tower Foundation of SJSU, the mace was designed and created this spring by Art and Art History Lecturer Yvonne Escalante, ’13 MFA Spatial Arts. She found inspiration for the design in both SJSU history and the paths students take to reach graduation. 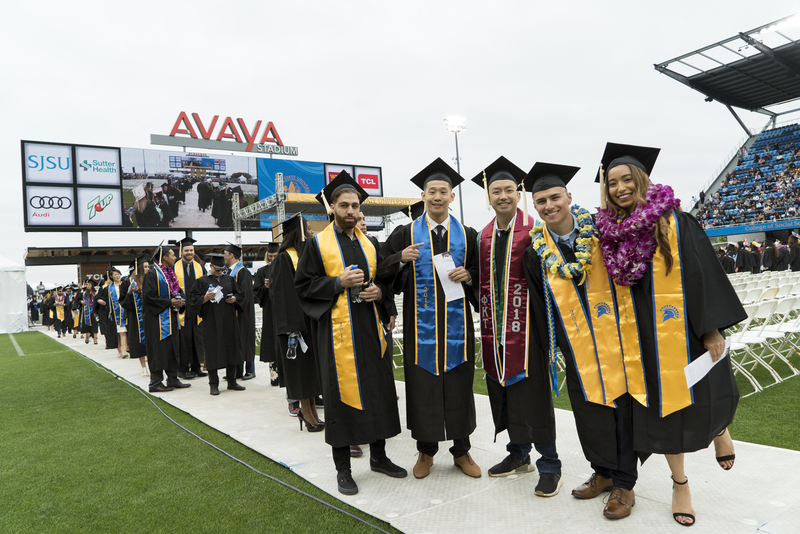 Avaya Stadium and the Event Center at SJSU were selected for this year’s commencement ceremonies in order to provide graduates and their loved ones with convenient and accessible venues. 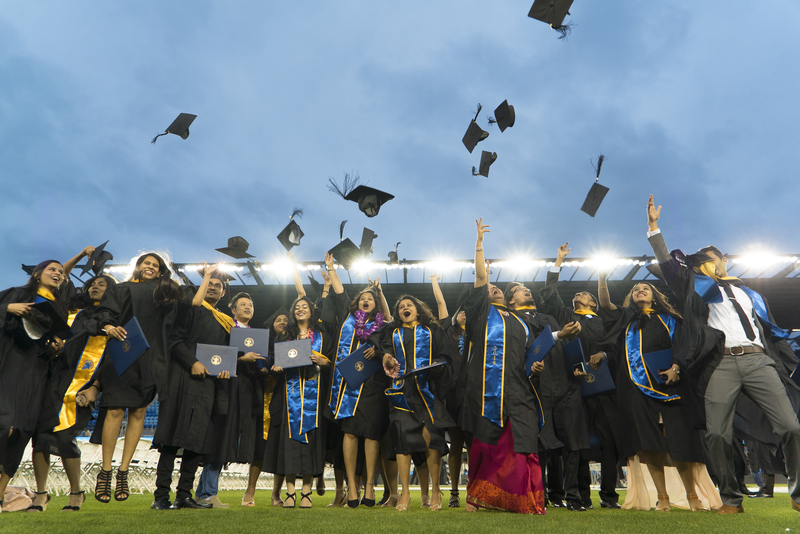 Avaya Stadium will host the Business, Engineering, Applied Sciences and the Arts, and Social Sciences ceremonies. The Event Center at SJSU will offer an on-campus setting for the Education, Humanities and the Arts, and Science ceremonies. Taken together, the selection of these two venues symbolize San Jose State’s history, leadership, presence and collaborative relationship with downtown, the City of San Jose and the region. 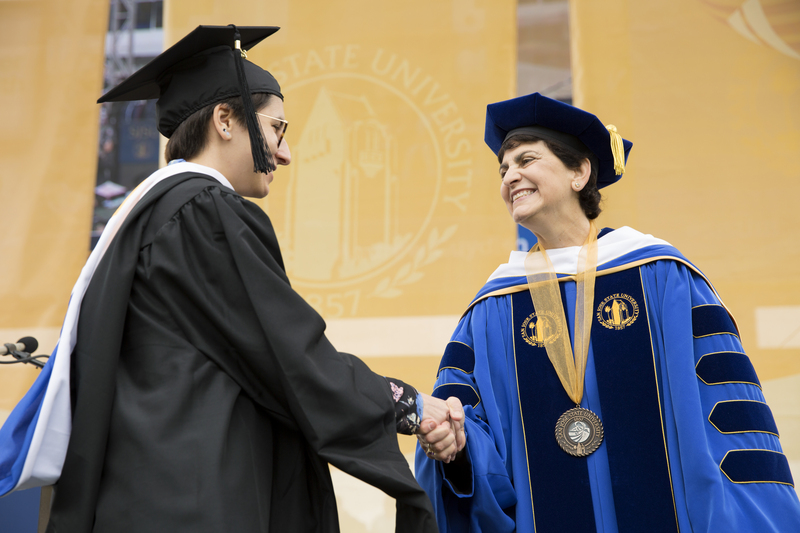 Another highlight is the conferral of degrees, when President Papazian invites students to move their tassels from right to left. It is a powerful moment for graduates and their loved ones, and one that is replicated throughout the California State University, the nation’s largest four-year public university system, with 23 campuses and eight off-campus centers.